It’s the place where your work dreams will come to life. It has to be a place where you want to be – where you can focus and be productive. You are going to be spending the majority of your time in this space. It will need to be functional as well as inviting. You want to find out how to set up a home office? First, let’s talk about the fun stuff. I secretly love stationary and could go nuts if let loose in our local Officeworks. WIth that being said, I never clutter my desk with stationary unless I use it on a regular basis. If it isn’t high use stationary, then it gets removed from the desktop. I keep a little stationary box full of the items that I know I need but don’t often use, away from the desktop. Because I don’t use a lot of paper, things like a stapler, hole punch, scissors and sticky tape get put in the box. I always keep a container of pens close by, with a highlighter. I have an A4 and an A5 note book containing sections, and sticky notes. I’m addicted to sticky notes. Whilst my husband has never really understood my need for a printer, I rely on it for when I really need to proofread something, or play about with paragraph placement and structure. Also, sometimes I will print out articles that are filled with gems, so that I can get out my highlighter and highlight my favourite bits for later. Whilst there are certainly online alternatives, I’m a bit old school that way. If your home is anything like mine, we have far more devices than people. The four us average over two devices each. So our chargers and cables can get a bit out of control. I highly recommend a multi-charger and some form of organisation to keep all of your devices looking neat, otherwise they get strewn everywhere. I bought an IKEA organiser for all the iPads we have. 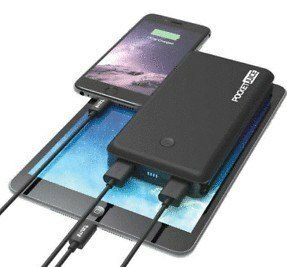 When it becomes full (probably not far away) I will buy one just for me, for my devices, like this one here. I love this. 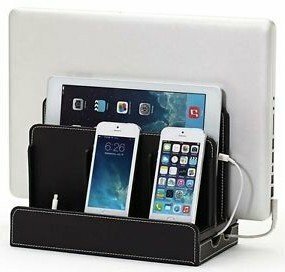 It will hold one laptop, one tablet, and three smart phones. You power it up using an external power unit. It looks lovely on a desk. I wish I had an excuse to buy one right now. I carry around with me a mobile charger that will charge my phone and my iPad, because I’ve been caught out too many times. You can get some great small devices that will fit in your bag and aren’t too heavy. You might consider putting something up on your wall that you find motivating that will inspire you to achieve your goals. 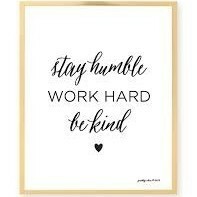 Whether it be an inspirational quote, a photo of your family, or even a framed pay check that means something to you that helps you want to strive for more. A very important part of your home office is the health and safety aspect. You must consider the set up of your home office as though you were working in a 9 to 5 environment. Just because you are working from home, doesn’t mean your health and safety is any less important. In this section I use the term ‘workstation’ for your work from office, because that’s exactly how you should be thinking about it. As you will be spending a lot of time sitting in a fixed position in front of your screen, the ergonomics of your setup are critical. 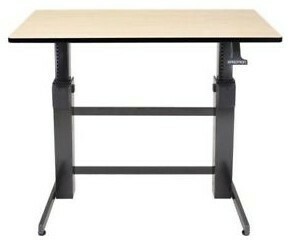 Your workstation should have adjustable elements to promote a healthy work posture. Keeping it adjustable allows you to arrange your workstation so that you can sit with your head, neck and back comfortably aligned. Arrange your home workstation so that you are able to sit with your elbows, hips, knees and ankles bent to about 90 degrees. Relax your shoulders and keep your upper arms close to your body. Consider your workstation as a whole when you adjust any individual part. For example, if you raise your desk height, you may need to adjust the height of your monitor; and f you raise your seat height you may need a footstool. It might take several tries to find the right adjustments to suit you so that you can work comfortably. Give yourself time to get used to any changes you make to your home office workstation. Remember to move and stretch frequently. A comfortable, adjustable chair is an important part of your home office. A great chair will swivel, have a breathable fabric, and have a seat base with a rounded front support. You should be able to easily adjust the seat height and the backrest for lumbar support. The chair should be safe and stable. Your chair should have appropriate dimensions for your body, for example, seat depth and width. It should have a padded seat and backrest. If your work surface is at the correct height or can be adjusted, adjust the height of your chair so that your feet are comfortably flat on the floor. Your thighs should be approximately horizontal and your lower legs approximately vertical. If you are on the smaller side and the work surface can’t be lowered, you may need a footstool to support your legs. Initially, you should set the seat to horizontal. Adjust the seat tilt so that you’re comfortable when using the keyboard. For most people this will be close to horizontal but sometimes others are comfortable with the seat tilted slightly forwards. 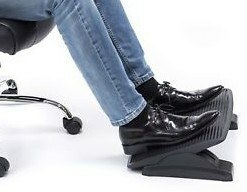 You may need to use a footrest if this places strain on your leg muscles or your feet don’t quite reach the floor. Your backrest should be adjusted so that it supports your lower back when you are sitting upright. Raise the backrest to its maximum height. Then sit in the chair and check the fit of the backrest to the curve of your lower back. 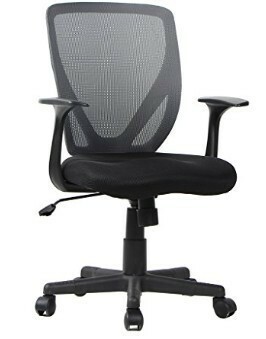 The lumbar support sits at waist height. If you aren’t comfortable, lower the back support, and give it a try to see how it feels. You might need to repeat this a few times until you find the most comfortable position that supports your lower back. The position of the backrest should be adjusted until you can feel a comfortable pressure on your low back area while you are seated in your usual working posture position. Try a number of different positions until you feel most comfortable. The backrest position shouldn’t feel as though it’s pushing you out of the seat or that you have to lean back too far to reach it. There should be a two-finger space between the front of the chair and the back of the knee. Some armrests create poor work posture and are generally not recommended. Armrests might prevent you from getting close to the table, encouraging you to lean forwards and disrupt the alignment of your body. Only armrests that are low enough to fit under the work surface when the seat height is properly adjusted are ergonomic. Unless you feel you really need an armrest, it’s probably a good idea to avoid them. The desk height should be positioned so that your shoulders are relaxed. If you use a keyboard, adjust the height of your work surface and/or your chair so that your work surface is approximately a finger length below the height of the elbow when you are seated. The work surface should be slightly above elbow height. If you do a lot of hand writing, a slanted writing surface might help. Ensure that you have enough legroom under the desk. If you are tall, you may need raise the height of your work surface. If you height challenged (the best of us are! ), you may need to raise the chair and use a footrest. Lots of people have discovered sit-stand desks. The best sit-stand desk, in my opinion, is the Ergotron. You can sit at the desk like a normal desk and adjust the height so that it suits you. You can also adjust the desk so that you can work whilst standing up. So you can alternate between sitting and standing depending on what you feel like. All materials you’ll be using should be within a comfortable reaching distance of both hands so that there is no unnecessary twisting of any part of your body. Items that you use the most frequently should be placed closest to you. If you use something only occasionally it can be placed further away. This is super important, because for those of us looking at screens all day, our eye sight must be taken seriously. Place the screen where your eyes can most easily focus on it. Usually this distance is no closer than an arm length away from you. You should position your screen so that the top is below eye level and the bottom can be read without bending your neck. This means that usually the centre of the screen is about shoulder height, and the top is approximately level with your eyebrows. Glare and reflections on your screen should be reduced or avoided by placing your screen where there is no bright light source either directly behind or in front of it. Generally laptop screens are too low and the keyboard is too cramped to use comfortably for anything but short periods of time. If you spend more than two or three hours on any given day working on a laptop, then it is recommended that a separate keyboard, mouse and screen should be used. Many laptops have very small screens. Screens smaller than 15” really are too small for use over long periods. In these situations, a separate full sized screen is preferable. Monitors are now relatively inexpensive, so it is worth making the investment in yourself if you do spend lots of time on the laptop. 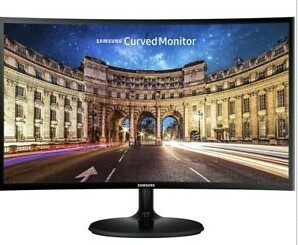 For example, this new Samsung 24″ curved LCD monitor is only $149US. If you can manage it, it’s certainly worth the investment. The best position for your keyboard is flat on the work surface. Then use the feet under the keyboard to tilt the work surface to a slope that you find comfortable. Position your keyboard so that your forearms are close to horizontal, and your wrists are straight and relaxed (i.e., your hand is in line with your forearm). Try to keep your keyboard as close to the front of your desk as possible. When you are typing, align the B key at the centre of the keyboard with the mid line of your body. If you use a mouse, try to avoid working with the mouse away from the mid line of your body for long periods, because this can lead to discomfort in your neck, upper back, shoulder and/or arm. Try swapping the mouse from your dominant hand to the other hand from time to time to avoid fatigue. Another tip is to learn shortcut keystrokes for functions you use a lot so you can reduce mouse use. If your work surface is fixed at a height that doesn’t allow you to rest your feet on the floor while your hip and knee are at approximately 90 degrees, you should consider a footstool. It is recommended that ankle joints should be close 90 degrees, however, you may find that a slightly wider angle is more comfortable for you. Footstools should be wide enough to support both feet comfortably. Footstools may be flat or angled depending on your preference. If you have a document holder, place it close to the monitor screen in a position that doesn’t cause you to twist or bend your neck. If you use the phone a lot while also looking at your screen, either a headset is recommended, or use your phone in speaker mode if your environment allows. If your work involves a lot of time on the phone, place it where you can comfortably reach it without having to twist your boady. Lots of people have done away with the traditional desktop phone, and now just use their mobile, or a VoIP service. I certainly don’t have a landline anymore, and lots of corporates are also moving that way to VoIP services. Don’t forget that your business will not be a success unless you invest in YOU. I can’t stress this enough. 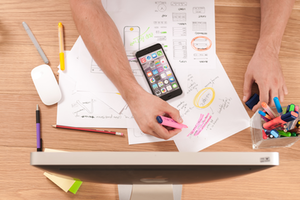 When you work in a large corporation, you usually have development opportunities easily available, but when you work for yourself, how do you keep on top of the latest and greatest in your niche? How do you get the personal development you need to keep you motivated, engaged, and on top of your game? I will save this topic for another day because it deserves significant attention, and I could write about it for hours. What I will say now is that YOU are important. Your emotional and developmental needs are important. Your physical and mental wellbeing are critical, so make sure you pay those things the attention they deserve. Need some inspiration to start a new career working from home? Find out more here. How do you set up your home office? Leave me a comment or a question and I’ll be happy to help.